Daughter of John Carter Newton and Lela Fredricka Vulta. Married first to Andrew DeMartini Cuneo; married second James Frances Sickman. 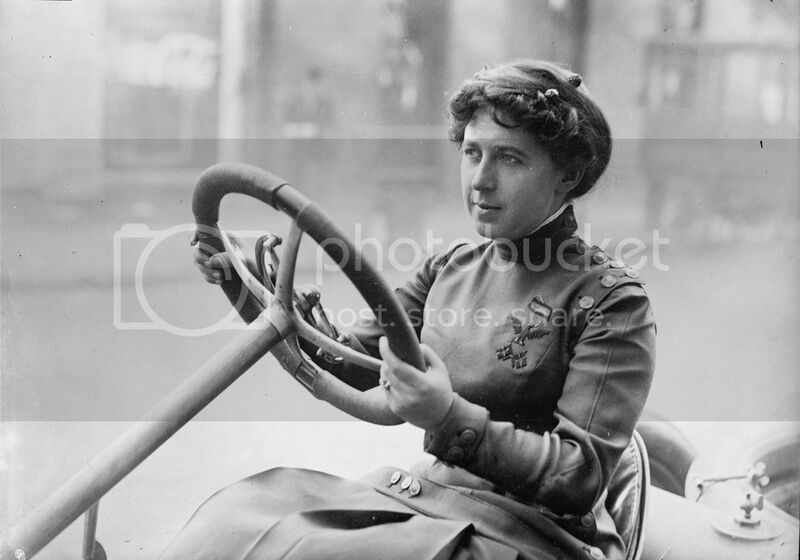 Joan first made the news as a contestant in the 1905 Glidden Tour, started racing the same year, and gradually became a spokeswoman and advocate for women drivers and the Good Road Movement." At least she did until she and all other women were banned from racing for nearly half a century, Nystrom notes. But before her gender was barred from the race tracks, Joan Newton Cuneo had raced against the fastest men -- and had beaten many of them -- and in the process had set several national speed records. And though born to wealth, she worked on her own cars, was a mother and social advocate for orphans as well as for women drivers and for better roads and cars for them to drive (Henry Ford asked her to help redesign the interior of his cars). Joan Cuneo, circa 1910. Library of Congress image from the Harris & Ewing collection. Ask most racing fans to identify the pioneering women of motorsports, and you’ll get names like Betty Skelton, Lynn St. James, Janet Guthrie and Shirley Muldowney. While each played a significant role in shaping the history of motorsports, Joan Newton Cuneo was winning races, setting speed records (and irritating gentlemen racers of the day) long before any of the others first turned a wheel in competition. Joan Newton was born to a wealthy family in Holyoke, Massachusetts, in 1876. The youngest of four daughters, Newton embraced activities such as bicycling and horseback riding, often considered inappropriate (or, perhaps, too dangerous) for young women of affluence. As the family’s wealth stemmed from the industrialization of Holyoke and surrounding areas, Newton even acquired skills such as operating the family’s narrow-gauge, short-line steam locomotive. As Elsa A. Nystrom explains in her book, Mad For Speed: The Racing Life of Joan Newton Cuneo, Newton was an independent sort, granted extraordinary freedom from a very early age, which likely goes a long way toward explaining her fearless demeanor in later years. 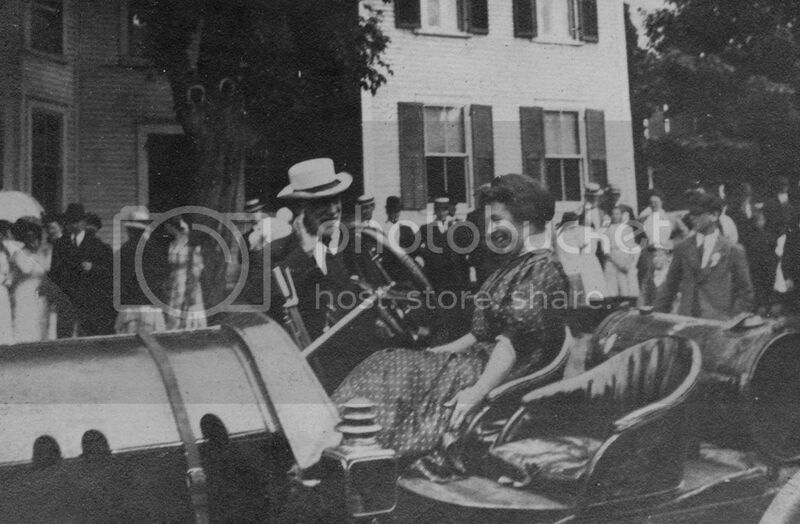 In Vermont, circa 1903; Cuneo is seated in the rear, behind the driver of her 1903 White. Image courtesy of Wilmington Historical Society. In 1898, Newton married Andrew Cuneo, a successful banker with ties to the Italian immigrant community in New York City. Though such a union may have restricted Newton’s access to dangerous conveyances such as the horseless carriage, Andrew Cuneo was understanding of his wife’s inclinations, and in 1902, Joan Newton Cuneo acquired her first automobile, a Locomobile Steam Car. Shortly after, the family would hire a young Louis Disbrow as a mechanic and part-time chauffeur, and it was from Disbrow that Cuneo would gain her remarkable understanding of mechanics. Within a year, the Locomobile proved to be too sedate for Cuneo, who next upgraded to a 1903 White Model C steam touring car, large enough for four passengers. At first, Cuneo found the car’s size daunting, equating its operation to “handling a huge ferry boat.” By 1905, she’d stepped up to an even more powerful White model, acquired after a dramatic proclamation: Accompanied by her husband and mechanic, Cuneo would drive in the inaugural 1905 Glidden Tour. 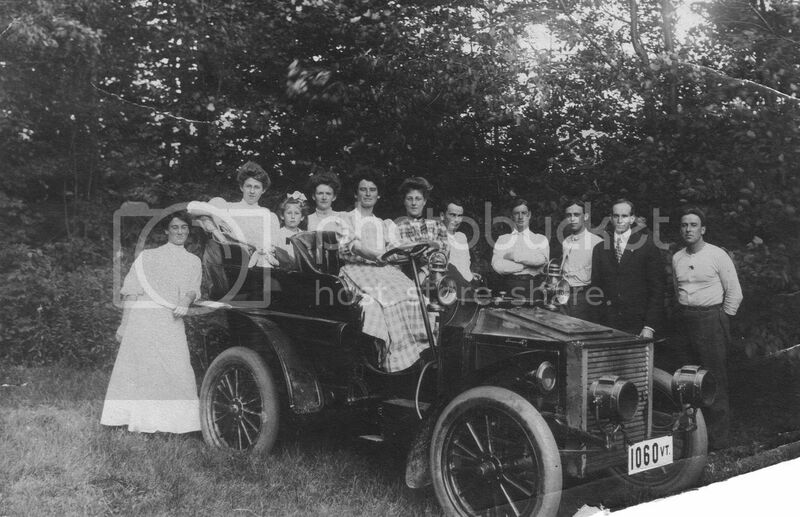 With the family, 1903; Cuneo is again in back, behind the driver. Image courtesy of Wilmington Historical Society. An endurance contest held on mostly primitive roads, the Glidden Tour ran a total of 1,350 miles, starting in St. Louis, Missouri, and eventually ending (via an indirect route) in New York City. Along the route, drivers could expect to encounter reoccurring breakdowns, fuel shortages (even steam cars typically fire their boilers on gasoline or kerosene) and weather conditions that could turn roads into muddy, rutted bogs, making them virtually impassable. Cuneo also faced a challenge of a different sort: Her 1905 White steam car made 15 horsepower, a full 50 percent increase over the model she was most familiar with. Her introduction to competitive motorsports was almost short-lived. On the second day of the event, Cuneo swerved to avoid another competitor driving in reverse. Harlan Whipple, the driver of the second car, was doing so to avoid a dynamite blast about to be set off by a road construction crew. In avoiding Whipple’s car, Cuneo lost control of her own, sending the White down an embankment and tossing it on its side in a stream. Cuneo, her husband and her mechanic were all uninjured, and period accounts reported that Cuneo re-lit the car’s burners herself, while it was still in the water. Circa 1911, behind the wheel of a Knox Giantess. Image courtesy of Wilmington Historical Society. Suddenly, Cuneo was a celebrity, with newspapers posting images of the daring woman driver on their front pages. The accident was hardly the only obstacle encountered in the tour, which saw Cuneo receive a speeding ticket (one of many she would accumulate during her racing years) and be banned from ascending the road up New Hampshire’s Mount Washington, perhaps the first time Cuneo encountered real discrimination in her racing career. The American Automobile Association, which sanctioned the race, deemed the ascent up the steep and winding carriage road “too dangerous” for the woman driver, likely as a result of complaints delivered by her male counterparts. At the time, driving a car required considerable strength, and racing required a vague indifference towards bodily injury; that a woman could drive as well as a man, therefore, was more than a little emasculating. Near the end of the tour, Cuneo’s White encountered transmission problems, which took mechanic Disbrow a substantial amount of time to fix. Though the group would ultimately make it to the event’s finish, the Mount Washington ban meant the Cuneo didn’t “complete” the tour, excluding her from a “first class certificate of completion” and leaving her only with a “second class certificate of participation.” While not the result Cuneo had hoped for, the outcome left her determined to run the event again. 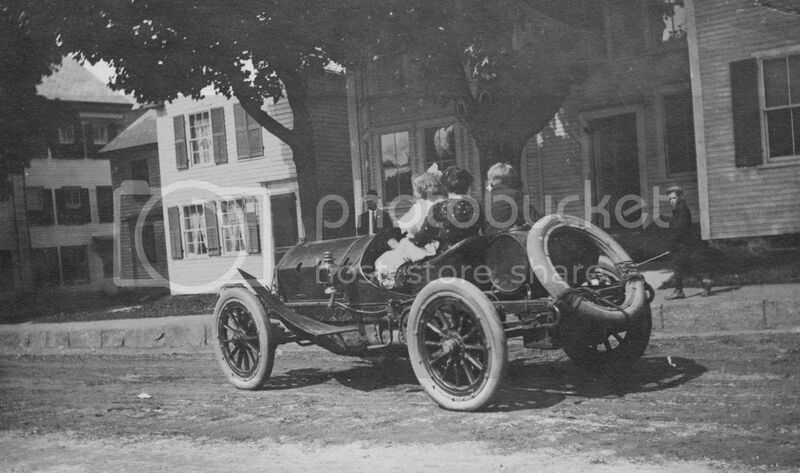 Driving the Knox in Wilmington, Vermont, with her daughter in her lap. Image courtesy of Wilmington Historical Society. Her husband’s business engagements kept Cuneo in Europe for much of 1906, but she would return to the Glidden Tour in 1907, this time driving a 1907 Rainier touring car with an estimated 35 horsepower. The route would differ as well, now stretching to 1,570 miles, and rule changes meant that only a club (associated with the AAA) could win the trophy. Cuneo had not been asked to join such a club, and thus had no chance at taking overall victory in the event. Nonetheless, Cuneo competed to win, encountering hardships such as a high-speed blowout, broken springs and a bent axle. Though she would not win the event, Cuneo once again finished, and set her sights on the following year. This time, Cuneo would be driving a 1908 Rainier touring car rated at an estimated 50 horsepower. She was a member of the Chicago Motor Club 2 team, and despite the numerous hardships encountered during the race, managed to finish with a perfect score of 1,000 points. More impressively, Cuneo had driven the entire tour herself, while other entrants, too tired to press on, called for the services of relief drivers. For her efforts, Cuneo received a silver cup from the other entrants for her sportsmanship and “pluck,” as well as a gold medal from the AAA and a second cup from the Chicago Motor Club for her efforts on its behalf. 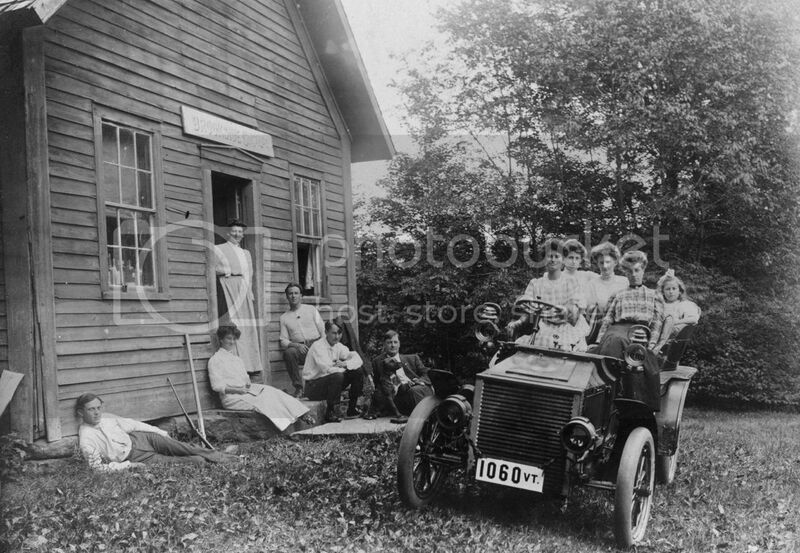 Old Home Week, Wilmington, Vermont, 1911. Image courtesy of Wilmington Historical Society. Now well known in the world of motorsports, Cuneo entered the 1909 Mardi Gras Races in New Orleans, Louisiana. After beating her previous five-mile speed record of 6:04 with a time of 5:05, Cuneo entered a 50-mile event where she finished second to the legendary Ralph De Palma; De Palma had completed the distance in 51:37, while Cuneo finished in 52:40, a mere 63 seconds behind. No other driver was even close to De Palma or Cuneo, and few could argue with her skill behind the wheel. During the course of the three-day festival, Cuneo would go on to establish several speed records for women, as well as capture three wins and two second-place finishes. Despite this, the AAA was growing increasingly uncomfortable at the presence of women in the sport, and by the end of 1909 banned women from entering events it sanctioned. 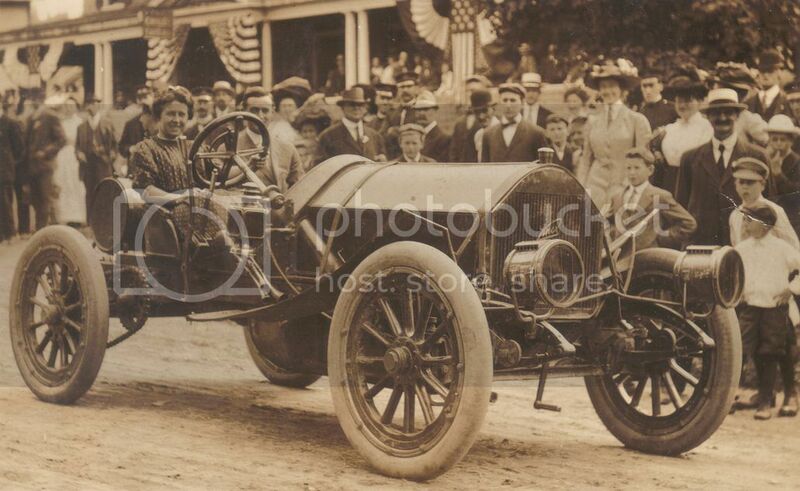 In 1911, Cuneo would set a woman’s speed record of 111.5 MPH behind the wheel of a Pope Hummer on the Long Island Motor Parkway, but the bulk of her racing glory was behind her by then. A little more than four years later, by the end of 1915, her marriage to Andrew Cuneo would be over, and in 1917 she would turn her back on New York for a rural life in Vermont. Even this relocation was temporary, as in 1922 she followed her son and his wife west, settling in Ontonagon, Michigan. Joan would marry James Francis Sickman there in 1928, but would die just six years later, in 1934, at age 58. Though largely unknown today, Cuneo’s daring exploits inspired other women to embrace a sport then in its infancy. While Cuneo’s name may be forgotten, her contribution to motorsports history is not. Special thanks to Mike Eldred and the Wilmington Historical Society for their help in compiling this piece. This book covers Joan Newton Cuneo's life and her role (from 1905 to 1915) as the premier female racer in the United States and spokeswoman for women drivers and good roads. Beginning with her family history and marriage to Andrew Cuneo, it traces their life in New York society, the birth of their children, and Joan's growing interest in automobile touring and racing and partnership with Louis Disbrow, her racing mechanic. The book covers Joan's experiences in three Glidden Tours, including her notes on the experience, her first races, and her rivals. It also looks at the growth and change of automobile culture and the battle for control of racing between the AAA, ACA, and the AAMA, which ends in the banishing of women racers shortly after Joan's greatest racing victories at New Orleans (in 1909). The book then follows Joan's attempts to continue racing, the end of her marriage, her move to the Upper Peninsula, and her remarriage and death. The book also includes a chapter on her female rivals in racing and touring.